Your pet has a favorite toy that is loved...well... to bits. Stuffing is seeping out its sides; it's missing body parts, or worse...it's headless. 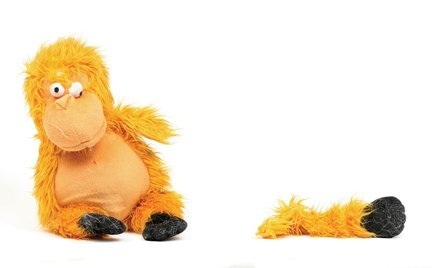 Whether it's a felt catnip mousie, a furry, stuffed squirrel or even a weird, yellow monkey, if it is your pet's prized toy it's likely been through the ringer. But your pet has no intention of parting with the dismembered toy. And you wouldn't even think of taking it away. Arne Svenson and Ron Warren totally understand the deep and endearing love a pet has for a cherished toy. They got the idea for Chewed, a new book, featuring 140 portraits of gnawed toys, when they were visiting a friend's house and were met at the door by her dog who had in its mouth a soggy and eviscerated one-eyed sock monkey. The authors asked friends to share their pets' toys so that Svenson could photograph them. "We began by coaxing these victims of tough love from pet-owning friends, some of whom confessed that they just might have an old pet toy or two lying around – only to then produce an astonishing array of mangled remains," said the authors on their website. "Soon we were inundated with boxes containing plush animals, rubber squeakies and unidentifiable bits and pieces." The book also presents a number of contributers (artists, writers, designers) who wrote short stories on their favorite chewed toy including Augusten Burroughs, Maira Kalman, and William Wegman (on the much-loved teddy bear of his famous dog, Man Ray). You can check out the Facebook fan page of Chewed. 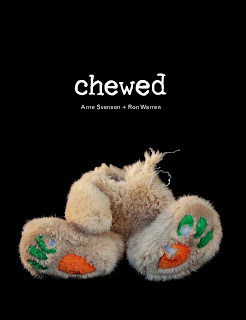 I am already a big fan of Svenson's and Warren's work and was excited yesterday, when I read about Chewed in Dog Toys Loved to Pieces in The New York Times. I loved Svenson's 2002 art exhibit, Sock Monkeys at the Julie Saul Gallery in New York City. I recommend their book, sock monkeys (200 out of 1,863). The book lovingly and poignantly portrays a portion of Warren's large sock monkey collection. Each monkey's unique personality shines through in the black and white photos. It appears the authors take the same warm and elegant approach to their beat-up toy subjects. Now, that's something to chew on. P.S. Love to know what is your pet's dearest toy! What a great idea for a book! Charlie has a one-eyed witch toy ("WItchy") that he just adores. I was thinking about doing a post about it! What I love about the picture of the 'disarmed' orangutan is all the dog (or cat?) hair on it! This is what all of Sookie and Darcy's toys look like after 5 minutes! Sookie's favourite toy is now sadly deceased - it was feathers on a stick. However everytime she'd play with it she would manage to pick off a feather then proceed to eat it before I could get it off her. There were eventually no feathers left. I think Austin's favorite chewed toy is me! Ouch! That is just darn cool! I think sock monkeys are so cute!!! What a most fun book! Thank you for the info about this book! Yay! Oh Dog! I just posted a picture of my favorite toy on my blog today! What a coincidence! My hairy slobbery sister Bob has a stuffed cat called BooBoo. BooBoo was a human baby toy that Bob gots the day she came to live with us 11 years ago. Bob has taken such good care of BooBoo that she still has the ribbon around her neck. One eye gots bited off when our other hairy slobbery sister Sam was a baby (she chewed it until Bob hid BooBoo). Mommy thinks this would be a great book (and a book about Sock Monkeys she HAS to read). She says she is going to go looking for them the next time wes gets to the big city! Thanks for sharing! what an incredibly clever idea! Cody's favorite toy is a red mouse that has seen better days. He has part of his "red" missing from the base of his tail. Dakota's favorite toy is a red white & blue plush ball that frankly is pretty disgusting looking right now...it is his least expensive toy and his absolute favorite! Now this is a brilliant idea for a book. As pet parents we can all relate to these tortured toys. I myself have honed my "stuffie surgical skills" perfoming limb re-attachments, eye replacements and sometime mass reconstruction. Oscar's favorite is his squeaky squirrel which has been in the operating room several times over. What fun! Thanks for letting us know about it. Flo has A LOT of de-stuffed, de-felted, de-squeaked toys. She can't help herself. "Chewed" looks hilarious!!! I have to admit, I discard the cat toys when they become dismembered or otherwise disfigured, LOL. That does look like a great book. Bet it is a lot of laughs. Thanks for the info about it. I think cats get tired of their toys before they destroy them but I might be wrong. They do destroy the scratching pads. Hope you have a super evening. My other fave are books...I want to chew them!! My cats love to chew my flip flops. They look like the surface of the Moon!